The Vertebrate Palaeontology Meeting (AKW) of the German Palaeontological Association took place in Vienna in 2019. Since 1974 all vertebrate palaeontologists working in Germany, Austria and Suisse come together for a scientific meeting over the weekend once a year. Every conference has an overall topic, but there are also a number of slots for open subjects. In 2018, the overall topic was “Biomechanics” which fitted extremely well with the research that I am currently doing within the ANR project Avineck in Paris. This year’s topic was “Biogeography” and the meeting was held in the beautiful Natural History Museum in Vienna (Austria). The museum is home to world-famous objects such as the Steller’s sea cow that became extinct over 200 years ago. I am very proud of a former student of mine that I co-supervised at the Muséum National d’Histoire Naturelle in Paris. 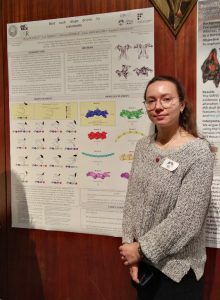 Olivia Plateau recently started her PhD on “Postnatal ontogeny of recent birds” in Fribourg under the supervision of Dr. Christian Foth. At the AKW she presented the results of her Master’s thesis on vertebral morpology in birds. I enjoyed giving an overview of my recent work in an oral presentation: From genes to fossils: Evolution of the head-neck system in tetrapods. See you next time at the AKW in Munich 2020!